Retail markets are based on cultural assumptions. And you assume a person walking into a pet store probably has a dog or a cat. If it’s a dog you take it for walks. But what are pet stores supposed to make of the urban chicken movement? People in urban areas these days are keeping chickens for the eggs and the meat. Or so I thought. Is it possible these urban hens are not livestock but pets, just like the dog and the cat. A co-worker of mine was in a pet store and spotted a product I’d never heard of. They were called chicken harnesses and, knowing I kept hens, she sent me a photo, thinking I might be interested. I was, though not because I wanted to buy one. 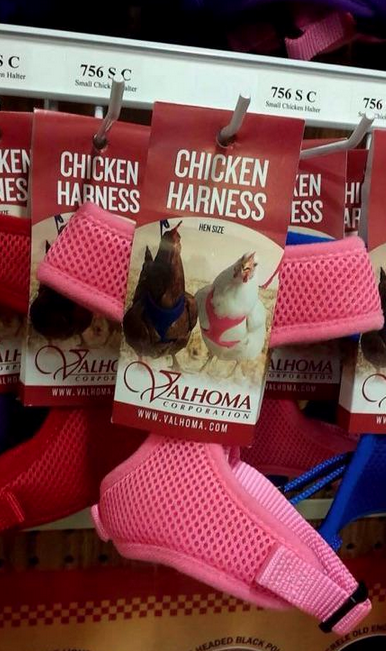 Let’s say you had one of these chicken harnesses. You put a chicken in it and fastened a leash to it, as shown in the promotional picture. What would you do next? There’s no point in putting a hen in a harness if you just keep it in the coop. The chicken wire already prevents escape. So they must suppose you would take the chicken out on the sidewalk and walk it, like a dog. I’ve always thought the mainline pet store retailers would eventually take aim at the urban chicken market. But I thought they would do it by selling, you know, chicken food. Instead, they’re selling something you can use to take your chicken for a walk. Suburbia has always been a mix of rural life and city life. It’s city life in a professional sense but it’s rural in the amount of land it takes up. Until now, that land has been dominated by a monoculture of grass, mown by dad. But that is slowly starting to change as chickens and edible landscapes take hold. Pet stores will get it. But it’ll take some time. This entry was posted on April 19, 2015 at 9:19 pm and is filed under Uncategorized. You can subscribe via RSS 2.0 feed to this post's comments. You can comment below, or link to this permanent URL from your own site.